The Nathpa Jhakri Dam is a concrete gravity dam on the Satluj River in Himachal Pradesh, India. 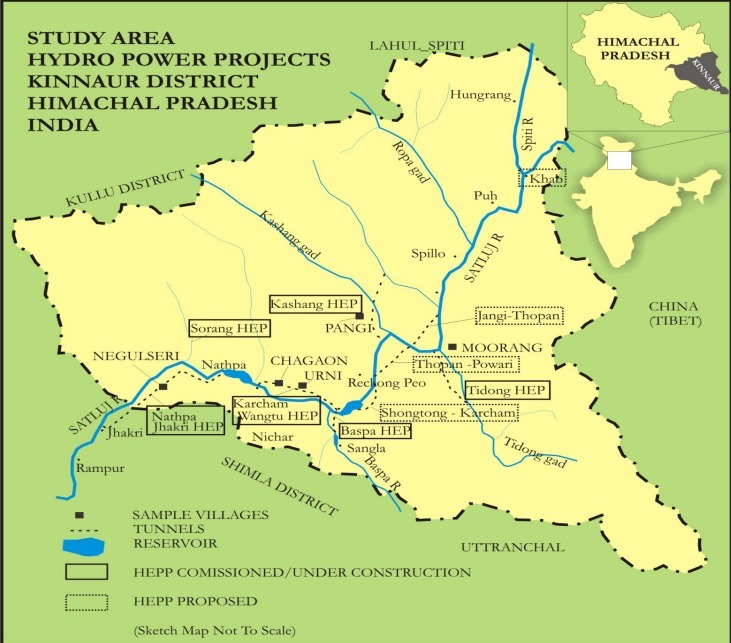 A Memorandum of Understanding for execution of the Nathpa-Jhakri project was signed between Government of India and Government of Himachal Pradesh in July, 1991. Construction on the project began in 1993; the original plan called for a five-year construction period, but a rockslide shortly after the civil contract was signed in 1993 required extensive stabilisation work, and the project had to be redesigned. The project was finally commissioned in May 2004 and officially dedicated to the nation by Prime Minister Manmohan Singh on May 28, 2005. The plant is mainly meant for generating hydroelectric power and has the capacity of 1530MW. It is owned and operated by Satluj Jal Vidyut Nigam (formerly Nathpa Jhakri Power Corporation Ltd), a public power company, owned by the central and state government, and financed on a 50:50 debt equity ratio basis. The project has been backed by the World Bank, after nearly ten years of abstention from any support of major dams; from 2005 onwards the Bank has substantially increased its funding to big hydro project once again, including Nathpa Jhakri but without any critical evaluation. The project was completed at a cost of Rs 8187 Crore. 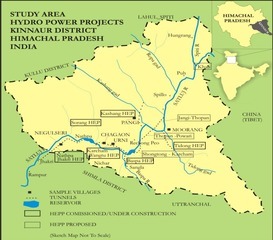 The plant supplies Himachal Pradesh and the Northern Regional Grid States in India. A high-voltage transmission system (220kV) transports power from the Nathpa Jhakri hydro station to Haryana's grid system. 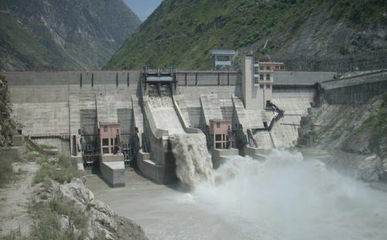 According to dam authorities, power allocation from Nathpa Jhakri hydroelectric plant to the North Indian states of Haryana, Himachal Pradesh, Punjab, Jammu & Kashmir, Rajasthan, Uttar Pradesh, Uttarakhand and the cities of Delhi and Chandigarh has enabled the grid to overcome power shortages in the region, while the Union Power Ministry is reportedly treating this as a benchmark for future hydroelectric projects. However, uncertainty and protests have been there since the construction. Flash floods in August 2000 led to extensive loss of time and money to the project, and caused so much destruction to the dam and powerhouse that the World Bank almost wrote off the project. Soon after it was taken over by the National Hydroelectric Power Corporation, though, employees worked round the clock to complete all restoration works to the pre-flood level. At the October 2001 and March 2002 review missions, the World Bank commended the phenomenal progress of works at the project sites and expressed its full satisfaction. But it was already in 1999 that workers at the plant denounced low wages and unfair working conditions, and the mobilization got attention at the national level, also due to the repression measures taken by the police . Local inhabitants have been complaining and denouncing the fact that the Satluj valley in Kinnaur has become home to cascades of projects which do not leave any stretches of free flowing waters; tunnelling, blasting and debris disposal into the river are causing major damages to horticulture, water sources, mountain slopes, besides affecting stability of the terrain and thus causing cracks of the houses. Last June 2015, more than 500 residents of the valley marched in the capital city, Rekong Peo, demanding the action by the district administration on the conditions of roads and generally on the infrastructures, severely damaged especially by the boom of the dam industry. There are close to 25 projects under various stages of construction and operation in Kinnaur district alone on the Satluj river and its tributaries. Major landslides near these project sites are causing regular road blockage at several places like Nigulseri, where Nathpa Jhakri HEP is located, Urni (near Karchham Wangtoo project), the stretch from Powari to Rally (Shongtong Karchham HEP) and Pangi (Kashang 1 HEP), to name a few . Representatives from 10 villages also submitted a memorandum highlighting precisely the tight connection between landslides, rock falls and slope destabilisation with hydropower development in the region. Project Details Nathpa Jhakri HEP has an installed capacity of 1530MW. In July 2014, according to the company SJVN, it generated an all-time record of power by producing 1,191.217 million units against the target of 1,083 million units . From the dam to the power house, water is diverted to a 27.4 km (17 mi) headrace tunnel. A large number of companies worked on the project. Kvaerner Energy of Norway provided the six 255MW Francis turbines and Kvaerner Boving of the UK the gates and valves, while the Eucona consortium of ABB, Kvaerner, Siemens, and Sulzer Escher Wyss won a US$200M main equipment contract. Canada’s Foundation Corporation and Impregilo of Italy carried out the construction work, while Indian firms Hindustan Construction Company (HCC) and Bharat Heavy Electricals Ltd (BHEL) also won contracts on the scheme. Company Names or State Enterprises ABB Kraftwerk from Switzerland - Supplier of the rotary components of the generators and the cabling and safety systems. Alstom from France - GEC Alsthom's Power Transmission and Distribution Division (T&D) won the order worth $55 million to supply and install India's largest gas insulated substation at Nathpa Jhakri. Sponsored by Indian Council of Social Science Research (ICSSR), New Delhi.